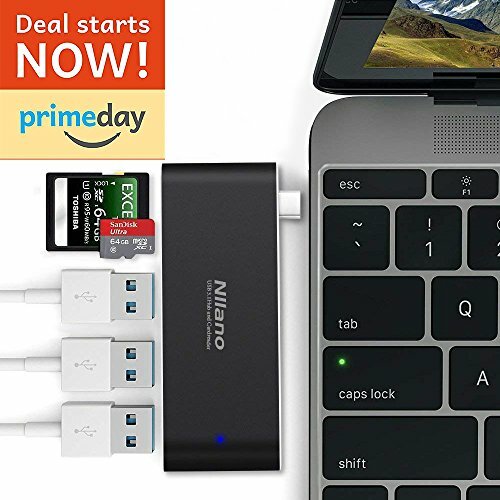 Nllano USB C Adapter, Support Thunderbolt 3,USB 3.0,Type C Charging and TF SD Card Reader for MacBook Pro (2016 and Later),iMac (2017), Multiport Adapter, Aluminum Alloy, Type C Hub (NLL-TZW001) by Nllano at Andy Pemberton. MPN: NLL-TZW001. Hurry! Limited time offer. Offer valid only while supplies last. Have you been tired of Apple's arrogance that only keeps one or two type-C ports? Have you been looking for a way to improve your macbook's function? Have you been tired of Apple's arrogance that only keeps one or two type-C ports? Have you been looking for a way to improve your macbook's function? Well, You can achieve it right now! The Nllano type C combo hub is all you need! Constructed with high grade aluminum alloy made with exact precision，making a USB Hub not only a hub, but a beautiful sight. The adapter matches your Macbook perfectly. Function and design finally meet in this thing! With USB 3.0, this HUB supports the maximum bandwidth of 5Gbps, only plug & play, without driver and without external power supply, high transfer speed makes work easier in the office or at home. This slim aluminum hub is designed to match the aesthetics of Macbook, also it allows you to tap out the full potential of your macbook. Extended USB Ports: Supposed to be used with portable devices such as wire keyboard, USB flash drive, 2.5mm external disk and other USB devices easily even when you don't have a USB-A to USB-C cable around you, free your from all kind of connecting cables. Mac-style Design: Unibody aluminum alloy exterior, ionized finish, reinforced TPE cable coating, and mac-style LED activity indicator, this high-quality multiport adapter will work with your macbook harmoniously and efficiently. Super High Speed: Up to 5.0Gbps data sync for SD/TF card reader, instantly transfer high resolution photos and video recordings from your camera and other devices, the compact design and powerful functions will will save you both time and effort. Widely Compatible: Compatible with new MacBooks/ChromeBooks/Surface laptops and more other type-c devices, so you just need this hub to connect your other devices with your new USB C phones and laptops conveniently. Risk-free Purchase: We are so confident in the quality of our products, we offer 100% satisfaction in our hassle-free Replacement Guarantee. We award 12 months warranty and provide full customer supporting service, so you can purchase our product without hesitation and worry. If you have any questions about this product by Nllano, contact us by completing and submitting the form below. If you are looking for a specif part number, please include it with your message.